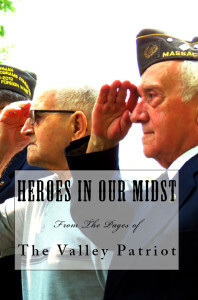 Join me at Mann Orchards in Methuen on Saturday, December 9th, from 10-2pm for a book signing for “Heroes in Our Midst, From the Pages of The Valley Patriot”. What a great gift for the veteran on your Christmas list. I will sign each book with a personal message. Books are $24.99 and for this book signing only we will offer a SECOND book for $20! The problem is, Steve Saba had nothing to do with “teaming up with Grayton” and wanted nothing to do with Grayton or his “team”. 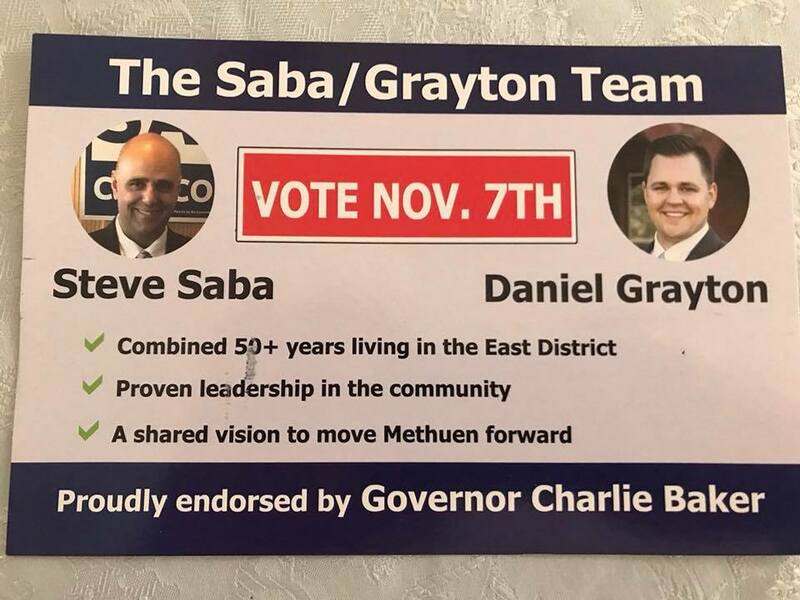 Sources close to Saba say he never sought and did not want an endorsement by the governor in a local race though he is fan of the governor. At the end of the day, voters knocked Grayton from his 3rd place showing (out of 5) in the primary to a 4th place showing (OUT OF 4) in the final election. 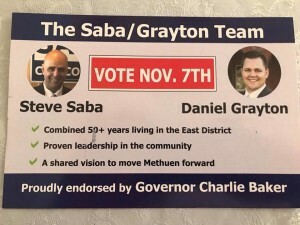 One of the candidates who worked very hard in Methuen, and most likely will secure an elected spot next time around, is Methuen’s East End candidate Adam Chiocca. Chiocca came in 4th in the primary and then ascended to 3rd place in the final election. Though Adam is not from Methuen originally, he knocked out life-long resident Sid Harris in the primary. 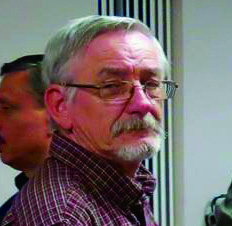 Then he placed higher than former councilor Dan Grayton in the final. Adam was always an underdog in this race but his refusal to run a dirty campaign and his willingness to do the hard work required in a contested campaign means he is certainly a contender next time around. With his extensive experience in education, my recommendation is that he run for School Committee next time around so he can help the two Janas and DJ Deeb fight for transparency in the schools. Those at the national level, who like to run around claiming voter fraud doesn’t exist in their quest to a bogus political agenda, need to spend a little time in Lawrence at election time. On Election Day our news spotters witnessed illegal campaigning inside the polling locations, at least two election workers handing little slips of paper to voters, with certain candidates’ names on them, not to mention dozens, and dozens, of people who tried to vote more than once under different people’s names. We know of dozens who were turned away by some election workers. But, those are just the ones we know about (because they were turned away). There’s no telling how many people actually made it through without being caught. Add to that the chain of custody issues with absentee ballots where both Lantigua and Rivera supporters were handling absentee ballots BEFORE they were mailed in or turned in to city hall. Don’t tell me there’s no such thing as voter fraud, because anyone who is actually on the ground during a Lawrence election witnesses a whole different reality than the fantasy spun by CNN and Elizabeth Warren. SPEAKING OF WARREN… IS DAN RIVERA A RACIST? Here’s something that will make you go ‘hmm’. U.S. Senator Elizabeth Warren (who is a rich and White) has publicly claimed on many occasions that Voter ID “is racist” and that those who support Voter ID are “purposely trying to suppress the minority vote.” Which is weird, because last month Warren came to Lawrence to endorse Dan Rivera for mayor over Willie Lantigua. What’s weird about it is that the man she endorsed, Dan Rivera, (an actual minority) strongly supports Voter ID, while Lantigua strongly opposes it. So, I guess the real question here for Elizabeth Warren and the Democrats who push the bogus narrative on Voter ID is, is Dan Rivera racist? I mean, why would Warren endorse Dan Rivera (an actual minority) who wants to “suppress minority votes”? If Rivera is not a racist, then it’s obvious that Warren and the democrats are lying when it comes to Voter ID and shows what hypocrites she and her party are by endorsing people who support Voter ID. If Rivera IS a racist the same logic applies. Things that make you go hmmm. You know, it’s awfully tiring to hear people claiming that White people in Lawrence are racist while ignoring or making excuses for the rampant racism in the Latino community. If you look at the numbers on Election Day, Latinos topped the ticket in every white precinct in Lawrence, showing proof that Lawrence’s white voters are predominantly not racist. But when you look at the numbers in the At-Large City Council race you see the opposite in Latino neighborhoods when it comes supporting White candidates. Rich Russell was the only white guy on the ballot for the At Large city council race and his numbers were average in white neighborhoods (though he did not top the tickets there). But, Russell was CRUSHED in every single Latino neighborhood despite having the endorsement of the current Latino Mayor, Dan Rivera. and the endorsement of the Puerto Rican Pac. In fact, Russell went from just a few votes out of THIRD place in the primary (out of 9) only to come in 6th (out of 6) in the final election this month. Rich came in last in every single Latino neighborhood in Lawrence. That’s not an anomaly. Every year, the color blind white voters in Lawrence disregard race and vote for who they think is the best candidate. But, every year, regardless of any other issue, Latino voters snub White candidates on the ballot where they inevitably come in last. So, please don’t tell me that racism is a White disease and that minorities can’t be racist, because those of us who see the reality of day-to-day life in Lawrence know better. You have to hand it to Lawrence Mayor Dan Rivera, if there’s one thing he understands about the voters in Lawrence, is that they have a short memory and are easily fooled. During the last days of the election, Rivera sent out a mailing attacking former mayor Willie Lantigua for “laying off 29 police officers” not to mention 28 firefighters when he was mayor. While the mailing is not inconsistent with the facts, Rivera conveniently left out the fact that as a city councilor he voted in FAVOR of all those layoffs. In fact, not only did he vote with Lantigua to strip down the police and fire departments, long after the effects of those layoffs lead to rampant gang violence in the city, Rivera continued to defend his vote. To this day, Rivera has never once said he regretted what he did. Yet, he had no problem putting all the blame on Lantigua (who needed Rivera’s vote to pass the layoff measures). Add to that, the fact that Rivera supported a $35M bailout loan for Lantigua when he was mayor and you start to see why Rivera’s campaign dishonestly made it look as though he was against the police and fire layoffs under Lantigua. To be fair, Rivera has refilled some of those positions but, the Lawrence police and fire have been working without a contract for the last three years. Just imagine. Police officers and firefighters in LAWRENCE, with all that they have to go through every day, having to work without a contract. While we can disagree on issues without being disagreeable, it’s really hard for me to get past the dishonesty on this one. I have completely lost confidence in Rivera as mayor, and I’m truly hoping now that the election is over he is going to work hard to restore that confidence. A good place to start would be to settle the police and fire contract and give these guys their back pay that he owes them. That would go a long way to restoring my faith. Until then… I remain hopeful, but skeptical. Andy Vargas defeated Shaun Toohey in the Haverhill state representative race to replace Brian Dempsey. In the waning days of this campaign Vargas, for the first time ever, made a declarative statement about sanctuary cities and deporting illegal aliens who are also violent felons. Vargas, known as “Mr. Sanctuary City” after he warned the public of ongoing police raids in Haverhill, told the league of liberal women voters in a debate that he is not for sanctuary cities and further declared that he favors deporting violent felons who are here illegally no matter where they came from. Curious. Especially since most of the people out holding signs for Vargas were doing so because he’s on their side of the sanctuary city issue. But, OK… I’ll play along. Now that Vargas has been elected he has a chance to prove us all wrong. He now can show us his initiatives from the floor of the house that will allow local law enforcement to work with the feds to deport gang members, drug dealers, and other violent felons. For me, I don’t believe for one second that Vargas is anything but a left wing ideologue who wants open borders and cede control of our immigration policies to the leaders of other countries. Sometimes, it does happen, I turn out to be wrong. I’m hoping this is one of those times. I will be watching Andy Vargas. And I will be holding him to the promises he made at the League of Liberal Women Voters’ debate. If Vargas goes in that direction I will be the very first to report on it. Just know that if he betrays the voters, I will also be the first to write about it. The Lawrence Lions Club will be doing eye screenings this month at the Tarbox School and at the Daybreak homeless shelter in Lawrence. The Lions provide instant results for those who need eye screening and are happy to help those who cannot afford eyeglasses or eye surgery if problems are found during screenings. Thanks to the new president Steve Paine who is kicking off his new term as president,and committed to providing actual services to the community. Last month the Methuen Exchange Club donated $100 to Eagle Scout, Ben Walko for his project to build a flag area and benches at Methuen High School so that the outdoor area where students congregate will have a flag and flag pole for watch of the different branches of the military. The Friends of Onway also donated $100. When Ben’s project is unveiled we will list all the businesses in the community who donated to this worthy project and a photo of the area. Great Job Ben! Last month, the Valley Patriot published a short story and an ad for the South Lawrence East Little League because their president Bryan Thomas has been paying out of pocket for a storage pod on the field for kids to store their equipment. While Bryan is always happy to make personal sacrifices for the kids in Lawrence, the additional expenses he has to shell out of pocket for other SLE Little League has made it hard for him to continue paying so much. That’s why we were thrilled to learn that someone at Jean Darc Credit Union in Lowell saw this story (first, thanks for reading us!) and contacted Bryan to let him know that they are donating $350 to SLE to pay for their storage pod. We want to thank Michele Silveira and everyone at the Lowell branch of Jean Darc for stepping up to the plate and helping kids in Lawrence! Valley Patriot family member Steve Blackwood is putting together a local movie in Newburyport and is looking for some short money to complete his short comedy called “Meet the Author”. The movie will feature Blackwood, a former Days of Our Lives star, as “Marvin”, who is also co-writer with David Susman (Spice). Veronica Alcino (The Irishman) will co-star as “Marnie”. The professional crew will include director and DP Jonathon Millman, an Emmy and Telly award-winning cinematographer and produced with Masterclass Productions, a Boston area collaboration of Masterclass talent and industry professionals. The North Andover Commission on Disability Issues is an official all volunteer body whose members are appointed by the Board of Selectmen. The mission of the Commission on Disability Issues is to serve the town in an advisory capacity, to identify the needs of the community under the ADA Civil Rights Law, and to monitor initiatives generated by this committee to see that results are achieved. We continue to work to bring accessibility to both town-owned and private facilities in our community. As part of this mission, the North Andover Commission on Disability Issues is pleased to announce that: Ms. Wheelchair Massachusetts will be visiting North Andover on: Sat., Nov. 18th at 1pm at the Stevens Memorial Library. With a campaign pledge to put the taxpayers first, Prinzivalli is already working hard to protect the taxpayers by collecting signatures for two different issues. Prinzivalli is also collecting signatures to start the process that will create an amendment to the Commonwealth’s Constitution that says taxpayers are not required to fund abortions.